Hambright teacher Lorien Gilbert works with students in the Sign Languae Club. 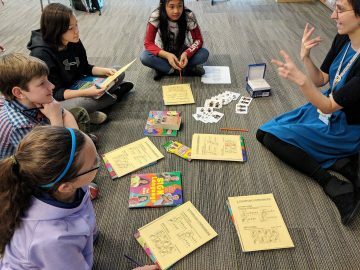 About 30 Hambright Elementary School students meet after school every Wednesday to learn a new language, with the goal of breaking down communication barriers with people who are different than themselves. But, the members of this club aren’t learning a traditional foreign language. They’re studying American Sign Language and Signed English under the direction of teacher Lorien Gilbert. Gilbert started the club to give students an opportunity to connect with hearing-impaired individuals who often feel ostracized. She is assisted by the school’s librarian, Tara Etzweiler, and Nasy Sok, an aide at Hambright whose two daughters, Jessica and Soksopia, are in the club. Gilbert said that is the main goal of the club – for students to connect with others with whom they would not normally communicate.